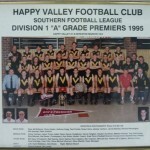 The modern Happy Valley Football Club was born in 1952, wearing Blue and Gold in the Hills Central League. In the early sixties we left the Hills League to join the Glenelg, South, West League, and it was at this stage, to avoid clashing with Glandore, that the Vikings made the adjustment to Black and Gold, the colours by which we are now known. 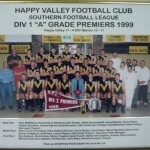 The Valley won premierships with their top side in both 1970 and 1974 under the captaincy of Wayne Baxter, but these were in the third division of the league. The Happy Valley and Aberfoyle Park area was mostly vineyards or sheep paddocks. We were a little known and rather insignificant power right up until the eighties when we joined the Southern Football League (S.F.L.). 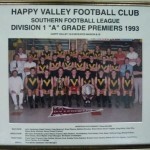 We were accepted into Division 2 and promptly made the Grand Final in our first season, playing regular finals football until 1984 when we moved to Div. 1. The mid eighties in Div.1 saw the Big V on the end of some big thrashings. And the mood changed. A lot of people, too many to mention, decided to change the culture. Some very important and very gutsy decisions were made that turned our reputation as one of the ‘easy beats’ in the competition to one of the most feared and respected clubs in the S.F.L. We threatened to make the finals in 1990, got there in 1991, and won flags in 1992, 1993, 1995, 1996, 1998, and 1999. 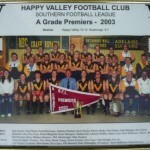 The club then had a break for a couple of years whilst we waited for our juniors to become men, and won the A grade premiership in 2003. Since that year we have not missed a finals series and reached the preliminary finals on two occasions, taking out the A grade premiership again in 2012. The last few years have seen a rebuilding of the Club with our A grade just missing out on finals – however 2019 is looking bright for a finals appearance. Many attribute our success to the development of the area. Having the biggest high school in the state right next door certainly helps, no question. To be the best though, requires more than just numbers. You also need the best coaches, the best trainers, the best support staff, and the best administration possible. We have been very, very fortunate to have had a large number of exceptional and quality personnel involved as part of our club. Our forefathers have left a legacy we can all be proud of, and we can all walk taller on the back of their success. Our standards are high. Our expectations are high, and the rewards so far have been worth the effort. Currently, the club is run by a dedicated number of volunteers, all of which have the best interests of the club at heart. Many of these individuals may go unrecognized, but their services and duties are always duly noted by those in ‘official positions’. Due to this dedication by officials and volunteers, the club has been able to enter a number of teams throughout that entirety of the offerings by the S.F.L. In 2019, also the Club will have two Women’s and a U/18 team in the Adelaide Footy League and girl’s teams in U/14 and U/16 in SANFL Junior’s . With this dedication and the associated playing numbers, the Happy Valley Football Club also prides itself on providing the best facilities in the S.F.L. while being a family friendly environment. 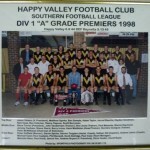 The Happy Valley Football Club has, and is, providing many opportunities for young footballers to learn and to develop their skills, and currently has players in both the SANFL and has had players in the AFL competition. If you would like to become a player, a member or a sponsor, please call the club secretary, Kevin Beard, on 0421 069 771, or contact the club through an email to happyvalleyfc@hotmail.com. Alternatively, you can contact us through the contact form provided on the contact us web page, or use one of the many social media pages that club actively monitors on a regular basis. THE VIKING’S FORCE IS DESTINED TO GO ON FOR MANY YEARS TO COME! Wear the Big “V” proudly!